Matheran, Queen of Hill Stations! This is Bombay's nearest hill station, which is an oasis of tranquillity with healthy & salubrious climate, unpolluted air, beautiful surroundings, charming shady walks, magnificent panoramic views. This popular holiday resort, is best visited during the season from October to May. 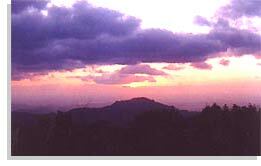 Many visitors come to this lovely hill station to get a new lease of life charmed by its refreshing atmosphere. Its dense forests, cool climate and the lines of hills scattered on all four sides, has a healthy and therapeutic effect. 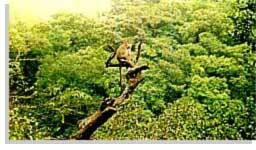 The name of this hill station refers to the dense growth of jungle as its head. 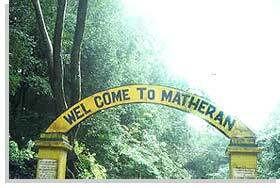 Matheran means a place topped by a jungle. The nearest airport is Bombay (Mumbai), around 100 km away. Mumbai to Neral is around 90 km, while Neral to Matheran is 21 km. Express trains leaving from Bombay and Pune should be booked for travelling up to Neral enroute to Matheran. This facility is only available for Deccan Express and Koyna Express from Bombay. Local trains also available from Bombay with no prior booking required. From the local station only take either Karjat or khopoli trains and get down at Neral station. From Neral a mini train takes the visitor up to Matheran a distance of 21 Km in about two hours. The journey is very picturesque. A taxi service also operates between Neral and Matheran 24 hours at the rate of Rs.70/- per head. This is the quickest mode of transport taking only twenty minutes. Passengers alighting at the taxi stand are advised to take a coolie ( approx Rs.250/- ) and proceed to the hotel via the railway line. Many enthusiastic hikers climb the hill from Neral on foot. It is a fairly stiff climb and takes at least two to three hours. 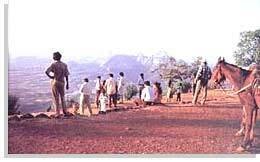 Once one arrives at Matheran walking becomes a pleasure and must.
" Matheran is dotted with about 33 lookout points -- many of them with quaint names -- from where you get spectacular views of the plains below or across the Western Ghats. You can hike your way to these through the woodlands. " Karsondas Mulji Library: founded in 1897 at the far end of Mahatma Gandhi Road. A sign on the wall reads, "No one ever really paid the price of a book, only the price of printing it. Panorama Point: 5 kms north of the post office, has the most spectacular views. Below lies Neral, to the west Mumbai and to the north are the Ghats. It's a popular place to watch the sun rise. Monkey Point: which look down over the plains. Porcupine Point: further to the southwest, is the popular sunset view. 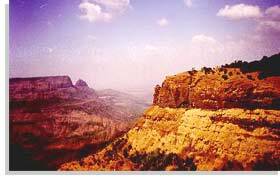 Louisa Point: 3 kms west of the post office, is on a plateau with views of the ruined forts Prabal and Vishalgarh. One of the nearby rocks is called Lion's Head because of its supposed resemblance to one. Echo Point: really does have an echo. 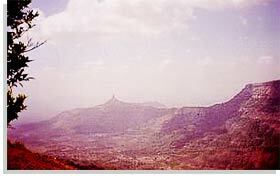 Chowk Point: 4 kms from the post office, is at the extreme southern end of Matheran. Rambagh: lies 2 kms away looking towards Khandala and Karjat. Alexander Point: one km to the north, one can see Garbut Point, the Chowk valley and the Ulhas River. 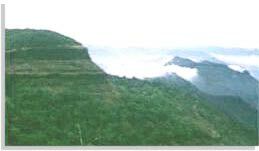 Mount Barry: is one of the highest spots in Matheran, with splendid views. Between Mount Barry and Panorama Point is Governor's Hill, another viewpoint.The Panthers' Caves and the Paymaster Park are other attractions, especially for children. Charlotte Lake: is the main source of drinking water for the town. The lake looks splendid in the monsoon, with swirling coffee brown water, but dries up in the summer. Near the dam are some food stalls and the main Hindu temple, the Pisarnath Mandir. The main Mahatma Gandhi Road is the bazaar, a small marketplace, not a commercial shopping complex. It runs the length of one street, and contains shops and stalls that sell the produce of Matheran. You can see workmen hunching over strips of leather, fashioning the Kolhapuri chappal that Matheran is famous for. Leather bags, leather belts, leather shoes& the workmanship is exclusive and the prices reasonable. There are also glass birds and dried wild flowers for sale that have a quaint appeal. Monkeys are your companions wherever you go. As you jog along in your buggy, monkeys dangle themselves strategically, one paw hanging free to grab your packet of chips. The variety of trees and shrubs, the lake, the bharang leaves that are used to treat snake bite, the most spectacular viewpoints. You can stand atop these peaks and survey the wild ravishing landscape, and the reddish brown mountain ranges.